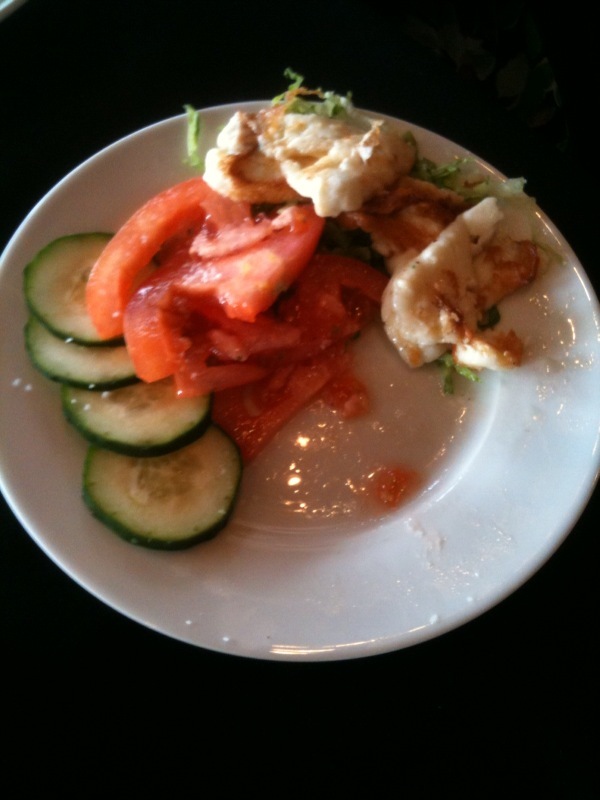 MC and I recently had lunch at a new Mediterranean restaurant in Madison, a restaurant called Mezza. Located in the former Roma’s Brick Oven, Mezza screams Madison. Strip mall location? Check. Beautiful view of Highway 463? Check. Chili’s within 50 yard proximity? Check. All snarkiness aside, we are always excited to try a new place. The lunch menu looked very interesting. Mezza has a large selection of small plates/appetizers, a few salads, and a few entrees. To get a taste of the place, we chose a couple of small plates, a couple of salads, and a dessert. We spent 10 days in Greece on our honeymoon and devoured moussaka nearly every day. Unfortunately, the moussaka at Mezza was nothing like that of Greece [edit – because it is Lebanese moussaka]. No bechamel, no spicy meat, and just a little eggplant. This dish needs to be completely reworked I am apparently not a fan of Lebanese moussaka. Next up was the fried cheese. We ordered this small plate on the waitress’ recommendation. She claimed to “sell a lot of it.” It was only described as unbreaded, fried Mediterranean cheese. That proved to be an apt description. The cheese was a salty, presumably sheep’s milk cheese. When combined with the cucumbers and tomatoes, it made a satisfactory appetizer, although probably not one that I would order again. We also had two salads, both of which were half eaten before the camera was even discussed (sorry, we are new at this!). Of the two, the house salad was an arugula salad (a.k.a. “rocket” to the Greek) that was fine, if a little boring. However, the fattoush salad was full of flavor and very garlicky. It made my wife’s breath stink but it also made her happy, so I consider it a win. The baklava was well-made and a good finish. The bill came to around $28 pre-tip, which was a tad on the high side for the portion sizes but we were both comfortably full after cleaning our plates. I’m on the fence with Mezza. On one hand, the menu is creative and offers Mediterranean fare that cannot be found in other restaurants. However, the food took forever and was just OK. The salads are very good. The fried cheese is fine, but I wish they would have specified that it is sheep’s milk cheese. The prices seemed a tad high and the service was very slow. Being that it is a new restaurant, we will give it a month or two and report back. This entry was posted in Restaurants and tagged Madison, Mediterranean, Mezza, restaurants, reviews. Bookmark the permalink. I’m not a fan of Mezza but did want to explain the moussaka. Greek moussaka and Lebanese mousakka are very different. 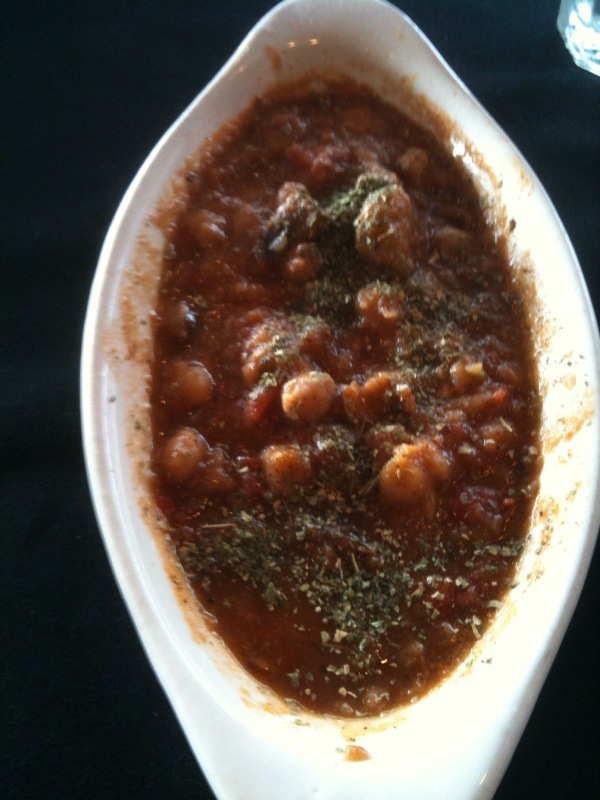 What you had was the Lebanese version which is stew and usually prepare without meat. Greek moussaka is typically more like a casserole with meat and cheese, which is probably what you ate in Greece. The chef/owner of Mezza is Lebanese and prepares moussaka the Lebanese way which is the stew type of dish as shown in your picture. Thank you for clearing that up – makes sense.